We love spring so much at Cricut because we start seeing pops of color return to the trees and blooming flowers. As soon as we see that color return, we’re instantly inspired to make projects that will breathe new life into our homes and relationships. There’s nothing like sprucing up your space with a pop of color or designing something fun for an upcoming party. Spring is that perfect time of year to try new things, so today, we’re going to show you some unique ways you can use cardstock. People typically think of cardstock as a card-making material, but we decided to take it to the next level… we’re going to show you some amazing dimensional cardstock projects that will blow your socks off. And the best part, you can make these projects so easy using Cricut and Design Space! 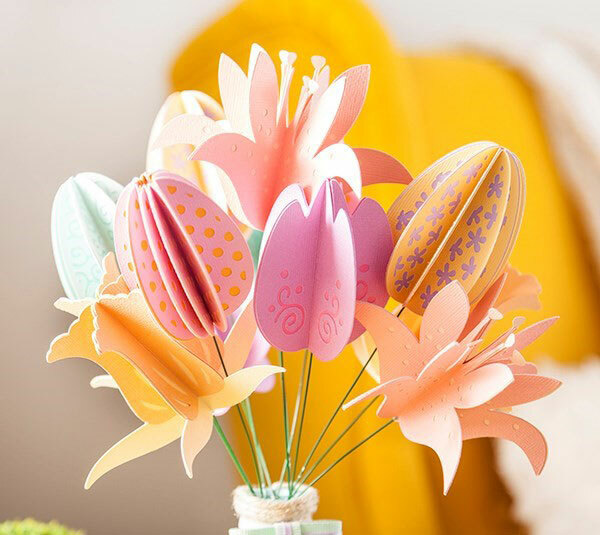 Whether you celebrate Easter or not, this springy colorful cardstock bouquet will add a fun touch to your dining room or an entry-way side table. All you need is a variety of cardstock, flower wire, and a couple other helpful tools, to make this bouquet. You can Make It Now in Design Space, which provides the full how-to! 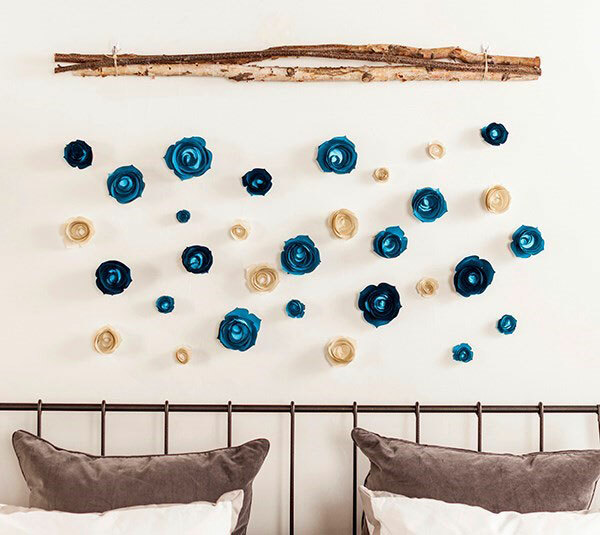 Flowers don’t have to just come out of the ground… you can make them bloom from your wall! This wall installation, designed by Idieh Design, is the perfect paper statement to add some lovely dimension to your walls. Heidi used fishing wire to hang the flowers and the best part, the rose design is a one-cut project! All you do is roll up the paper cut and glue the bottom flap of the rose… you can find Heidi’s full instructions here. I made them too, and it’s so easy! It took me about 3-5 minutes to cut, roll, and glue one rose. Add a little sparkle to your cakes with the adorable glitter cardstock cupcake topper by The Wedding Lady. Making cupcake toppers is so easy – all you need is cardstock, bamboo skewers, and a paint brush! And the coolest part about cutting font projects in Design Space is that we have over 400+ fonts to choose from OR you can use own (literally fonts on your computer will aggregate in Design Space… pretty crazy, huh?!). 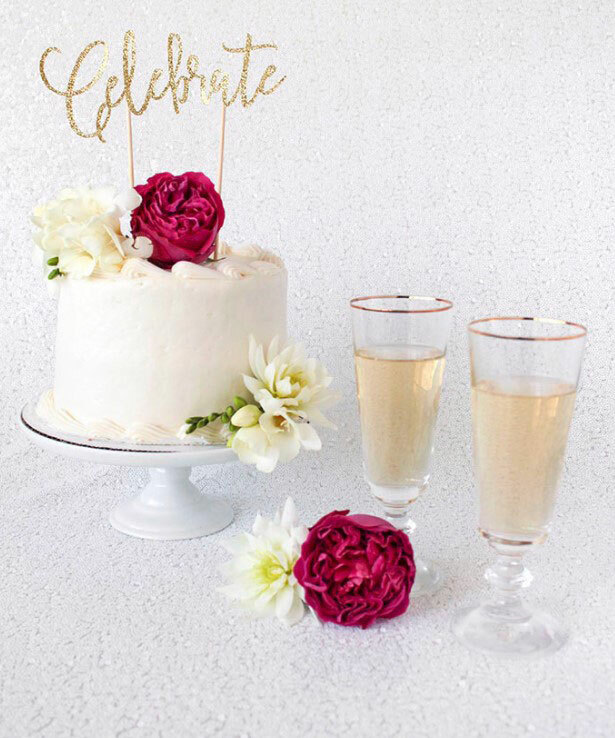 Some of my favorite fonts to use for cake toppers are Lipstick Lettering, Elegant Cake, Quarter note and Cursive 101. 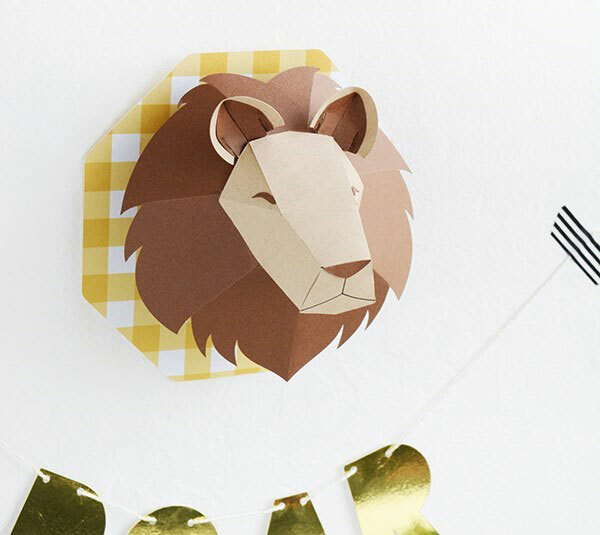 This cardstock lion is such a cute way to dress up your baby’s walls in a way that will seriously impress your family and friends. To be able to say you made a dimensional lion for your baby’s nursery? How cool is that? Now this project takes anywhere from 1 – 2 hours depending on your level of skill with Cricut and using cardstock… but when I tell you once you get the hang of it, these types of projects are super easy to make. Go check out this Make It Now project in Design Space here! When spring hits and you start having friends over for backyard BBQs, serve your beverages with a little extra personal touch. 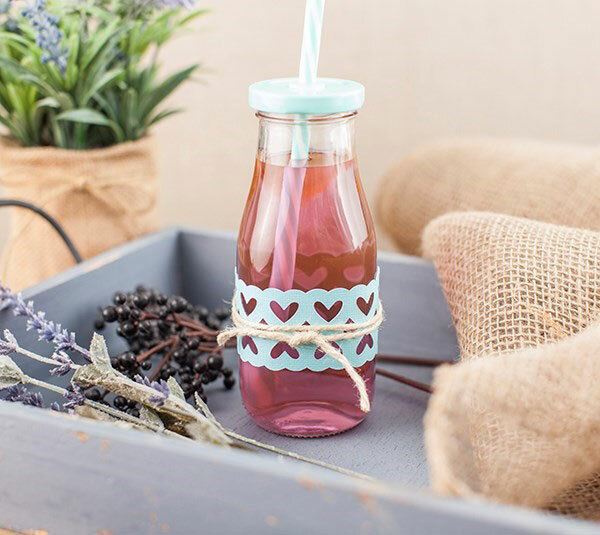 This milk bottle has been reimagined by our Cricut team with a fun cardstock wrap with a heart pattern cutout. Just grab some cardstock in your favorite color, twine, adhesive, and a plain bottle to complete this project! You can Make It Now in Design Space here. Now that we’ve shown you some of our favorite unique cardstock projects, what do you think? Can you go outside the box with cardstock this spring? Tell us in the comments or share your favorite projects via social with the hashtag #cricutmade! We can’t wait to see what you make for spring. Nice collection of ideas…thank you.